There are resources available even though felons may not believe they can find a job. Often, they must look at different career path and additional education. Some felons with accounting or tax experience might consider a career in tax preparation. This blog post will address the issue of whether or not a felon can get a PTIN. What is Required to Become a Tax Preparer? Anyone who prepares or assists in preparing Federal income tax returns for compensation must have a valid preparer tax identification number (PTIN). The PTIN is a nine-digit number that is used instead of the preparer’s Social Security Number for any Federal tax return completed. More than 60% of taxpayers pay someone to prepare their Federal income tax. A tax preparer is a person who completes the paperwork and performs the calculations for another person’s Federal income tax. Both individuals are required to sign the return, although ultimate responsibility for the information in their return falls on the individual whose return it is. In 2010, the IRS established regulations requiring preparers to register for a PTIN to be utilized in signing all tax returns prepared for compensation. There were more than 696,000 individuals within active PTIN in 2015. Anyone can be an unpaid tax preparer, but a person preparing tax forms for compensation must have a PTIN. Anyone applying for a PTIN must be at least 18 years old and report all information including professional credentials correctly. There are no formal educational requirements to become a tax preparer. Community colleges and universities often offer certificate courses that can qualify individuals for entry-level jobs as tax preparers. Professional organizations such as the Accreditation Council for Accountancy and Taxation (ACAT) and the National Association of Tax Professionals also offer tax preparer training programs. Voluntary certification from the ACAT is not required. Tax preparers who possess a PTIN and complete 18 hours of continuing education from an IRS-approved provider, including six hours of a refresher course in federal tax law updates, 10 hours of federal tax law topics, and two hours of ethics, will receive a Record of Completion that will apply toward a PTIN in the next calendar year. Anyone who applies for a PTIN must disclose and provide an explanation for any felony convictions in the past 10 years. The IRS will determine whether a felony conviction disqualifies a preparer from a PTIN on a case-by-case basis. The IRS will make a determination for approval or denial of eligibility for a PTIN after evaluating the entire application. 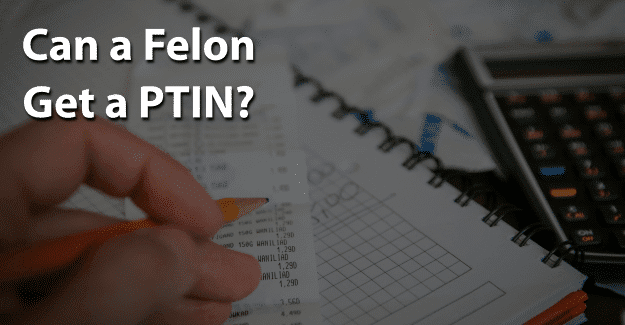 Even if a felon is able to get a PTIN, he or she still faces the challenge of finding an opportunity to do tax returns. Many may not be willing to give a felon a chance because of their record. Since individuals are responsible for any information reported to the IRS, they may not trust someone with a felony to handle their taxes. It is important to be honest in filling out an application when applying for a PTIN or a job preparing tax returns. If a felony isn’t disclosed but is found on a background check, this constitutes fraud and is punishable. It is a crime to falsify an application, which could result in being sent back to prison. In order to be successful as a paid tax preparer, it is essential for felons to be honest about their background. They are already seen with negative perceptions of being dishonest, untrustworthy, and unwilling or unable to follow directions from authority figures. Having their record expunged can give them the chance needed to begin with a clean record and succeed in obtaining a PTIN. Expunging a criminal record allows anyone to honestly state on an application that he or she has not been convicted of a crime. It’s a big challenge, but it might be worth it for a felon wanting to get a PTIN. Having his or her record expunged and also documenting any training programs or additional education could make the essential difference in a felon succeeding in getting a PTIN. What do you think about this blog post? Have you or someone you know been in the situation of trying to get a PTIN with a felony? What was that like for them, and how did they achieve success? Please tell us in the comments below.